Jeff Healey's Songs From The Road will be released 8 September on Ruf Records in the US and internationally, and by Stony Plain records, which will issue the recording in Canada. The live recordings were captured over a 15-month period at the Notodden Blues Festival in Norway (8/5/06), the Islington Academy in London (5/20/07) and Jeff Healey's Roadhouse in Toronto (11/15/07). Songs From The Road is the follow-up to Mess Of Blues, which was released just weeks after Healey's untimely death from cancer at age 41 on 2 March 2008. The song selections and performances showcase the breadth of Healey's guitar playing skills and soulful vocals, including psychedelic rock (White Room), bluesy versions of pop songs (Teach Your Children) Beatles classics (Come Together and While My Guitar Gently Weeps, the latter which Healey at one time recorded with George Harrison), Chicago and Delta blues (I'm Ready, Stop Breaking Down) and an updated version of the guitarist's biggest international hit, Angel Eyes. Other tracks include his take on The Allman Brothers Band's Whipping Post, Mark Knopfler's I Think I Love You Too Much and the rockin' Christmas chestnut, Santa, Bring My Baby Back to Me. "It's such a flashback; Jeff was in top form,' says Alec Fraser, who played bass in Healey's band and also produced the album. "As always, his repertoire was as wide as the Mississippi - Jeff always gave his best, even in the last days when he was seriously ill."
"All of us in Jeff's family, a family that includes thousands of fans around the world, are so pleased to see the release of this recording," says Cristie Healey in the album's liner notes. "Today, more than a year after he left us, we recommend this wonderful recording to you. Songs From The Road is the way we all want to remember him: Smiling, laughing and playing and singing from his heart." 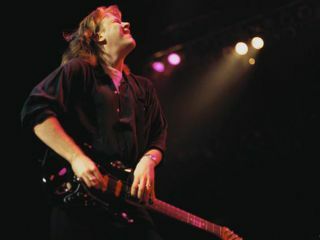 For more information, visit jeffhealey.com.